What is a "Dynamic Version Salt"? What else can be a 'Version Salt'? 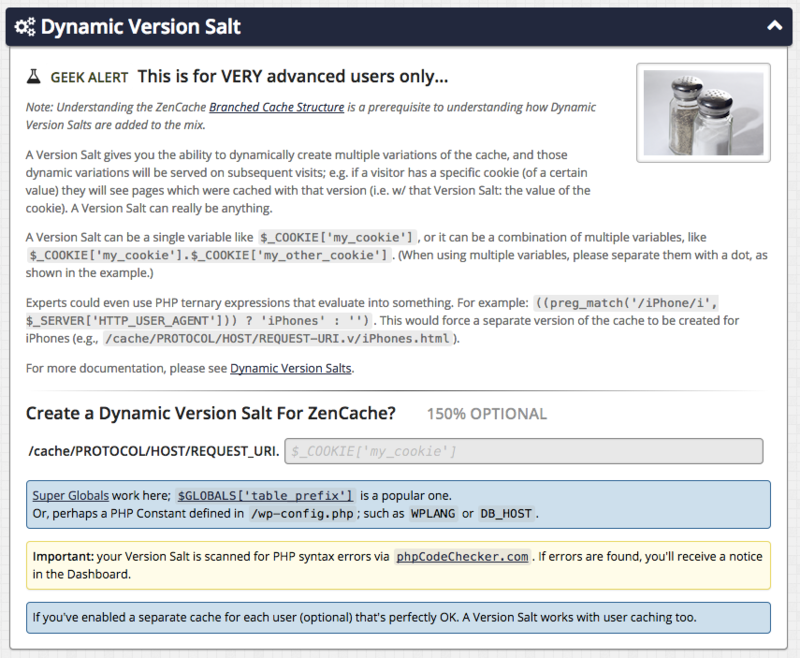 Version Salts via "Advanced Cache Plugins"
Why am I getting PHP Notices related to my Version Salt? Note: Comet Cache stores its cache files for each page of your site based on the PROTOCOL://HOST/URI that it's caching. For more information about how Comet Cache builds its cache files, please read Branched Cache Structure. Understanding how Comet Cache builds cache files is a prerequisite to understanding how Dynamic Version Salts work; otherwise you will be confused by the details below. 🙂 Please give this article a quick look-see before you read further. A Dynamic Version Salt (aka: Version Salt — shorter) makes it easy for you to create multiple dynamic variations of the cache. These dynamic variations will be served to visitors who meet the criteria defined by your Version Salt. ~ Yes, that sounds complex (and it can be), but it's actually quite simple in most cases. For example, if your Version Salt is a cookie, and a visitor has this cookie (of a certain value) they will see pages which were cached with a Version Salt that was based on that cookie's value. A Version Salt could be just about anything; but a cookie is a good way to demonstrate the power of a Version Salt. The main Comet Cache storage directory is located here: /wp-content/cache/comet-cache. By default, the cache file for this example Post with the slug funky-chicken would be stored and served from the following location (inside the main Comet Cache storage directory). Nothing special here, this is how Comet Cache works. See Branched Cache Structure. Now let's enter the following into the Version Salt field for Comet Cache, so that we may create multiple versions of this cache file when we want to; and each of these versions will be based on the value of a cookie named mycookie; available from the PHP Super Global $_COOKIE['mycookie']. I will enter the following into the Version Salt configuration field provided by Comet Cache in the Dashboard. A Version Salt can be a string literal, a PHP expression that produces a string, a PHP Constant that is equal to a string, etc... so long as it results in a string value. An empty string is fine too (i.e. if I don't want to use a Version Salt in some cases). This forces the value of $_COOKIE['mycookie'] (which comes from an untrusted source — the visitor's browser) to a string. If this cookie is not defined for a particular user, it will simply be equal to an empty string; i.e. there is no Version Salt used in a case where the visitor does not have this particular cookie. More importantly though, if the visitor does have this cookie, the Version Salt will be filled with the value of that cookie as it exists in the visitor's browser. Notice that Comet Cache detects the presence of a Version Salt, and automatically appends a .v (creating a sub-directory) and a cached variation is stored into the slugified cookie value; i.e. chicken lover 34 automatically becomes chicken-lover-34.html ~ nice! Instead of creating a Version Salt based on a cookie, we could base it on the User-Agent that a visitor uses to access the site (i.e. the device they are using). If you wanted to maintain a separate cache file for visitors who came to your site with an iPhone, you could detect the User-Agent string using the PHP Environment Variable $_SERVER['HTTP_USER_AGENT']. We can tell Comet Cache to create a separate version of the cache specifically for iPhone users. If the visitor comes to my site from an iPhone, I set the Version Salt to iPhones, else I leave it empty (i.e. no Version Salt will be used) and they will get the default cached version of my site. More importantly, if they are using an iPhone, they get the version of my site that was cached specifically for iPhone users. Notice that Comet Cache detects the presence of a Version Salt, and automatically appends a .v (creating a sub-directory) and a cached variation is stored for my Version Salt; i.e. iPhones.html ~ perfect! A Version Salt can be a single variable like $_COOKIE['my_cookie'], or it can be a combination of multiple variables, like $_COOKIE['my_cookie'].$_COOKIE['my_other_cookie']. Just be sure that whatever you choose is available early-on; i.e. before Comet Cache runs, so that it's available to be used in cache path formulation. For instance, something like get_current_user_id() would not work here, as this core WP function is not available to Comet Cache when it checks for a Version Salt. If you happen to choose something that is not yet defined when Comet Cache runs, you might produce an error on your site. See also, this line of code in the WP core to learn when Comet Cache is loaded by WordPress. Version Salt functionality (from a UI perspective) is available only in Comet Cache Pro. However, it is possible (even in the lite version of Comet Cache) to create a Version Salt through the use of an "Advanced Cache Plugin". Here is an example plugin file that creates a truly dynamic Version Salt, and this will work perfectly in both the lite and pro versions of Comet Cache. If you are a theme or plugin developer that would like to create a dynamic Version Salt that works with your application, please go by the example plugin file. Advanced Cache Plugins (aka: ac-plugins — shorter) are the recommended way to integrate your theme/plugin with Comet Cache; i.e. when you need to construct cache variations for one reason or another. Feel free to ask questions here as you work through your integration. A version salt of $_SESSION['example'] on a site that is running in WP_DEBUG mode; will kick back an E_NOTICE from PHP, since this is unique to certain visitors with a session and may not be present at all times. Thus, $_SESSION['example'] is technically invalid, at least some of the time. Another option would be to define the version salt inside /wp-config.php where you have more room to write clean code and build a version salt dynamically. Assign the result of whatever that routine does, to a PHP Constant that would then serve as your version salt. else define('MY_VERSION_SALT', ''); // Default value.